Things have been quiet on the blog front this month, as I’ve barely been in the UK. I spent a week doing all things food over in Cologne, then had a two week break to Florida with Mr WhatClaireBaked and his family. 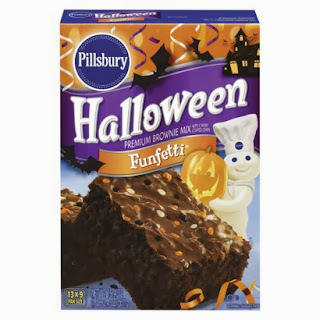 Having just made it back to home soil, I’ve not yet had a chance to create anything, but am looking forward to road testing a Pillsbury Halloween Brownie kit that I was given as a gift, when we were away. It’s not exactly technical baking, but could be fun! I wanted to dedicate my latest post, not to baking, but to eating…. As I’ve done enough of it recently. From handmade pasta served with truffles in Cologne, to good ol’ American Mac n Cheese in Florida, I’ve eaten it all recently. One of the highlights from my trip to Florida, was a little arty café we found, on International Drive. I swear, it was one of those random moments where we pulled up in the car to play pirate mini golf, like mature adults, the sign caught our eyes, we were in need of lunch, so we stepped in. Café Tu Tu Tango is like nowhere I’ve ever been in before. It plays host to local Floridian artists who use the café like a studio, then are invited to sell their work. Not only were we captivated by the café’s Mediterranean tapas style menu, we were overjoyed to see so much modern art adorning the walls. The whole place was covered, top to bottom, in a sea of colour. You could have it all… from tiny square canvases, to wall covering paintings. From monochrome, to works of only primary colours, it was an interior stylist’s heaven. 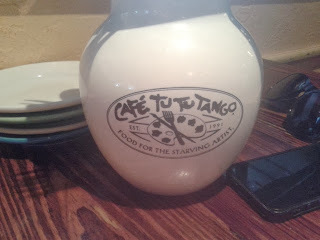 The café describes itself as: “CAFÉ TU TU TANGO evokes a time when artists found inspiration and community in sharing food, drink and philosophy with one another. The bohemian lifestyle fashioned life as a grand celebration, a feast of the senses to be shared and treasured. Together, artists found kinship over meals shared on appetizer-sized plates, over drink, music, and conversation. That alone sold the café to me… before I saw the open view kitchen. Food Heaven! My other love in America, is the free refill culture. It’ s hot outside, you get dehydrated and want to drink more. Hallelujah, the café provided these too! We could enjoy a drink, whilst perusing the art, and during lunch, they just kept coming. But back to food. 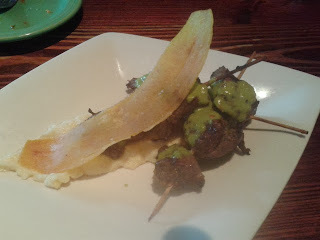 We ordered thee dishes to share: a spinach and feta dip, served with crisp baked naan bread, then Cajun chicken egg rolls, followed by Argentinean steak kebabs, served with an orange sauce. 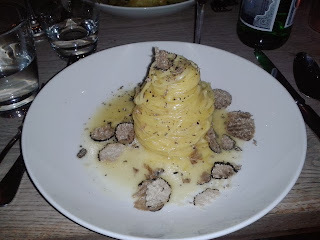 I can confirm that all three dishes were utterly delicious. We really loved the steak, cooked medium to our liking and tenderised perfectly. Between the two of us, three dishes were more than ample for lunchtime, although there were loads of others worth trying. Our bill came to $35 dollars, which we felt was great for the portion sizes and the quality of foods we received. 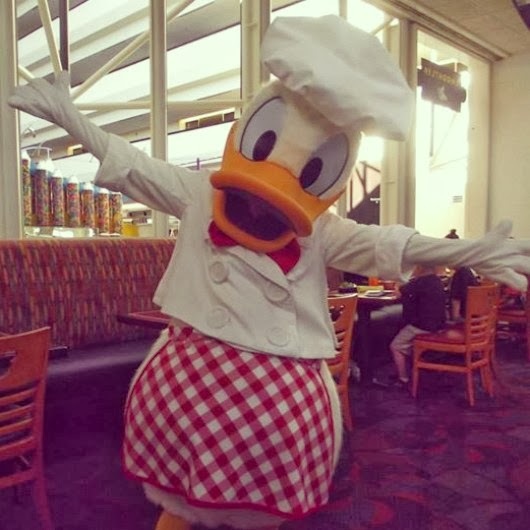 I’d absolutely recommend the café to anyone doing a Disney/Florida vacation. 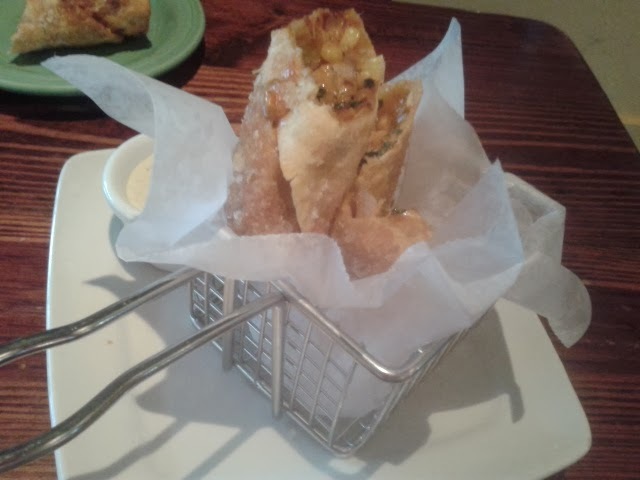 Cajun Chicken Egg Rolls - served in a cute wire basket! As all of my readers know, I have a soft spot for desserts. Especially when chocolate and ice cream gets involved. I wanted to share a few photos of the desserts we had at Disney. Numero uno… a rather large and tasty chocolate brownie sundae. My tip – buy one and share between two. No matter how much you love chocolate, you’ll never finish it! 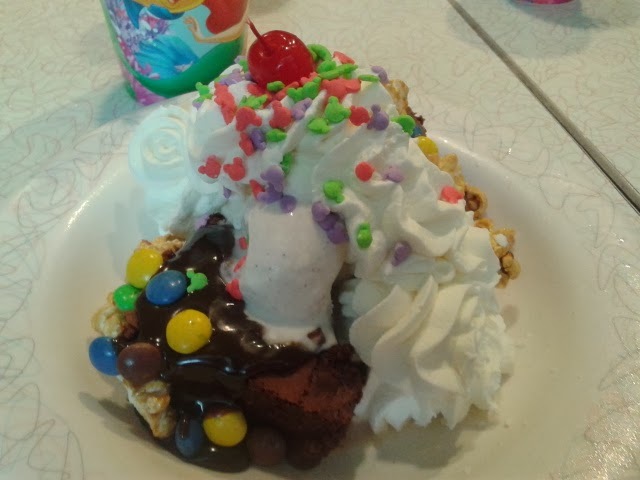 We enjoyed this at the 50's Prime Time Café at Disney’s Hollywood Studios. An epic experience in itself, for anyone who loves a little bit of retro in their life. Chocolate Brownie Dessert - delicious!!! Close up - spot the Mickey Mouse shaped sprinkles on the top! Number 2… my very own creation, from Chef Mickey’s restaurant at Disney's Contemporary Resport. Yes folks, I found my inner child. Whippy ice cream machine…. Check. Unlimited chocolate beans to top… Check. 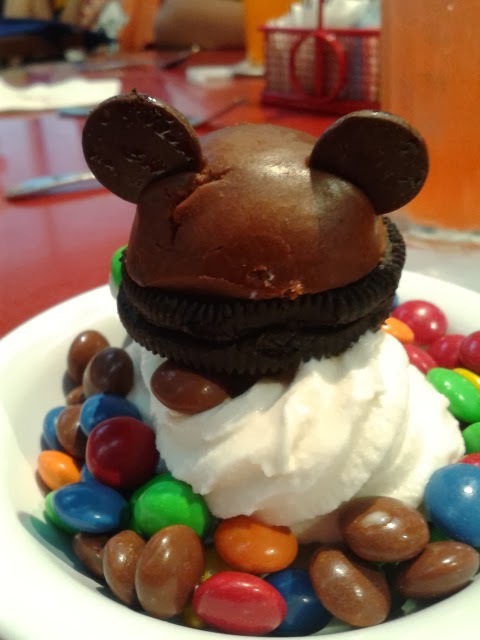 And to finish, Mickey Mouse created using chocolate buttons, chocolate mousse and an Oreo Cookie. 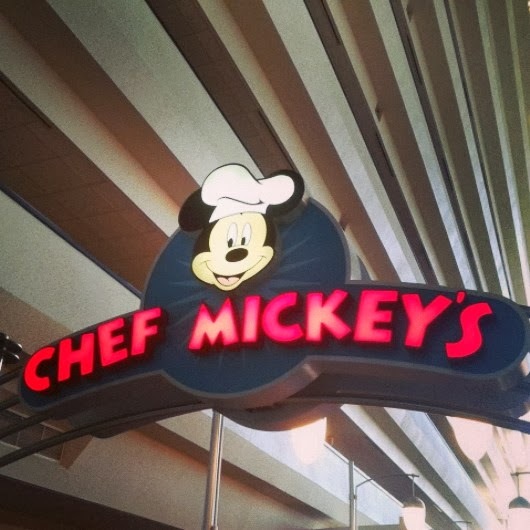 I’d recommend dinner at Chef Mickey’s to any family (young or old). We enjoyed our meet and greet sessions with Mickey, Minnie, Goofy, Pluto and Donald Duck possibly even more than the youngsters did! 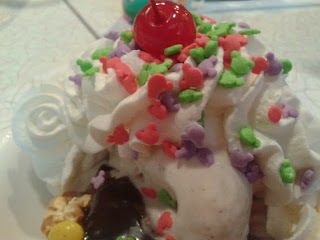 Mickey Mouse on top of my ice cream!!! Donald Duck poses for a photo at our table! All in all, a great trip and next month, I promise I’ll return to baking. Hopefully you've enjoyed something a little different in this post.